Holidays: A waste of time for founders and business owners? So the kids have broken up from school and the sunshine has put everyone in holiday mode. Perhaps it even feels like you are the only person left at your desk working! 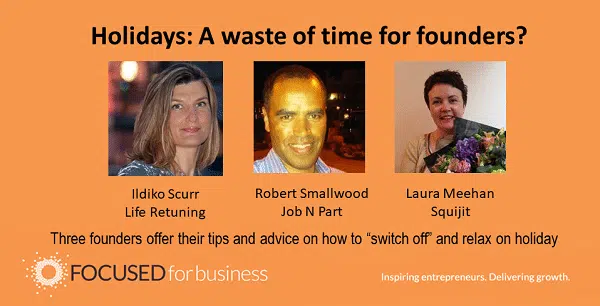 I asked three founders whether they thought holidays were worth it and what they do to “switch off” when on holiday. All three had a different approach to holidays and offered interesting tips and advice on how to relax. I hope these will give you the break you deserve. Perhaps unsurprisingly, Ildiko Scurr Founder of Life Retuning thinks holidays are vital. If you are anything like me, in the weeks running up to going on holiday you work twice as hard to clear your “To do” list so you can leave things with a clear conscience. The trouble is this can mean you start the holiday exhausted and find it hard to relax and “switch off”. By the time you have finally relaxed it’s time to go back to work! Robert also finds it hard to do nothing. If you are still wondering whether you can spare the time for a holiday this summer, take heed! If you are still believe a holiday is not worth having because you won’t be able to switch off, then you could always find out more about Ildiko’s Re-Minding process, and book a “Beyond MindFULLness” masterclass which teaches how to put your thoughts into silence so that you really can “switch off”.